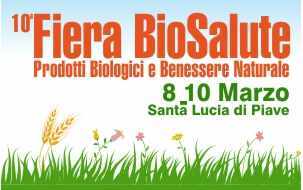 From Friday 8th to Sunday 10th March the 10th edition of Biosalute Triveneto, Fair of organic and natural wellness will be held at Santa Lucia di Piave (Treviso). The fair takes place inside the "Le Antiche Filande" pavilions and in the adjacent outdoor areas. During the 3 days of opening the public will have the opportunity to meet professionals and producers of Biological, masters of massage, operators of holistic disciplines.